Business cards are an inexpensive reminder for someone that they liked what they saw and want to come back later, either in-person at a show the next day when it’s “shopping day”, or later that week online. Yes, many of your business cards will end up in the trash but it is an inexpensive advertising option. Your business cards don’t need to be complicated or expensive. Moo business cards are classy and eye-catching,, but cards from Vista Print or GotPrint (or anywhere else) will do just fine and not burn a hole in your convention budget. On your cards, include your most essential information (name and website) and an image or two of what you create to remind them who you are. I like to remind people that I’m easy to find online but I don’t always get the chance to mention it to every person that stops by my table. 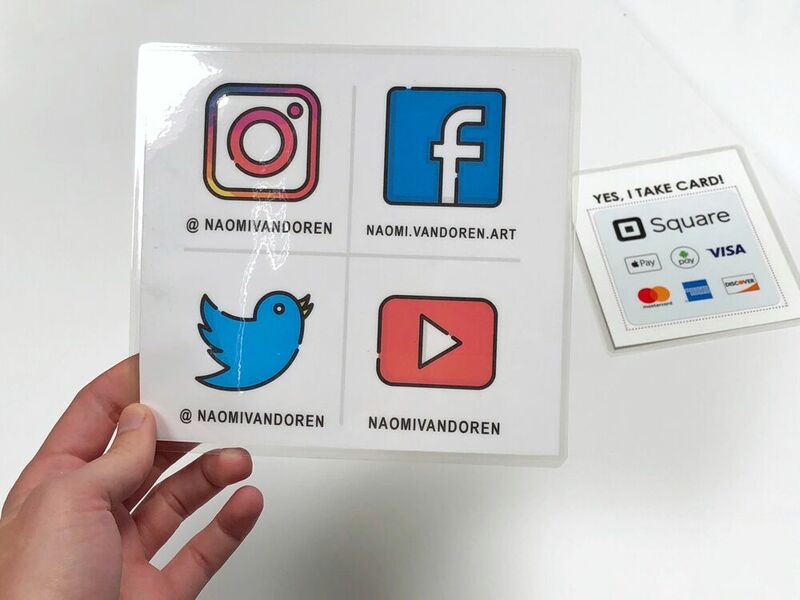 That is why I made a simple social media card that stays at my booth for people to quickly look me up or photograph for later. The more eco-conscious fans appreciate it as well since they can easily snap a photo and leave a business card. First off, it goes without saying that if you’re an artist, at any level, you should have a newsletter already. With that out of the way, having a signup sheet at a show is one of the easiest ways to get people to subscribe to your list. Your signup sheet doesn’t have to be fancy, a sheet of lines and an indication of what information you want is enough. I recommend collecting a name and email to keep things simple. Typing in names can be a little tedious once you reach a certain number of signups so I’ve taken it a step further and have an iPad to collect emails from shows. I use MailChimp’s signup application called “MailChimp Subscribe” to collect information easily. My iPad is an early generation iPad that can hold a charge throughout a show, and I keep it in a locked case that is latched to the table for added security and peace of mind. This year I began the exciting journey by joining Patreon and have been thinking of inventive ways to share the platform to those interested in joining me. I got the idea for a card from Pete while I was at ACEN this past spring and thought it was genius! My Patreon cards use the Patreon branding so they’re easily recognisable by those that are familiar with the platform. The second reason I have the card is to introduce the concept to new people. If someone is unfamiliar with my work I honestly don’t expect to get Patreon signups from them. But introducing the concept to someone through a small card is one way I can help build the growing awareness towards this new and exciting platform. Naomi VanDoren is an artist who spent much of her life abroad. She grew up in the Spice Islands of Indonesia. A childhood of travel and immersion into a variety of cultures at such a young age left her with the desire to explore the earth and share her experiences through art. She has a formal education in graphic design and began pursuing illustration on her own after moving to Japan in 2013. Naomi dove deep into painting digitally full time, and her passion for drawing and painting blossomed. In 2015, she experienced painting in watercolor for the first time and found it to be the perfect medium for traveling and she hasn't put it down since. Currently she is developing projects around her own foxdragon creatures.